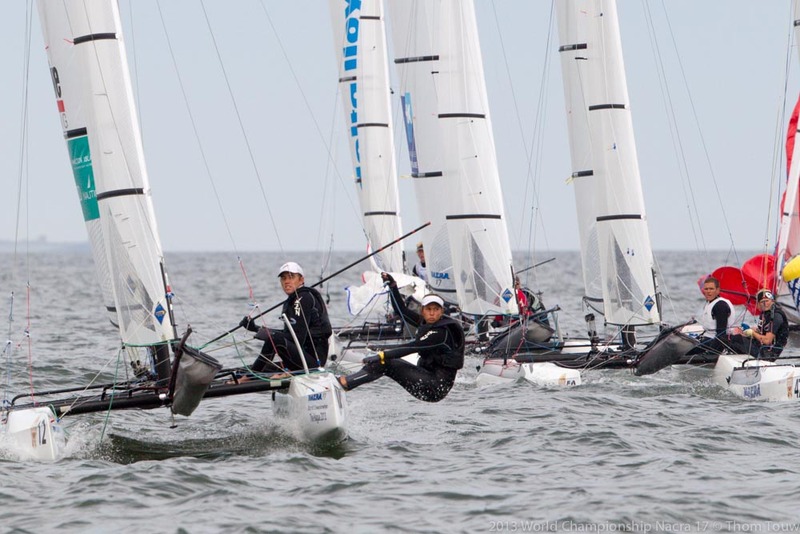 Australia’s Jason Waterhouse and Lisa Darmanin have booked themselves a spot in the medal race at the 2013 Nacra 17 World Championship in The Netherlands after a great day on the water on Friday. They have also earned their way into the Australian Sailing Team. Waterhouse and Darmanin went into the penultimate day of racing in 12th position, needing two good races to move themselves up into the top 10 for Saturday’s medal race. Light winds again made the going tough in The Hague, with a thunderstorm also slowing down proceedings. Nevertheless, the gold fleet managed to complete two races, with Waterhouse and Darmanin finishing eighth and fourth. The results moved the pair up to sixth overall, just seven points off the bronze medal position ahead of the final race double points medal race for the top 10. “Today was another exhausting day for all the sailors as we experienced a wide range of conditions. However, both races were held in about five to seven knots of breeze with a raging current making things interesting," Waterhouse said. “We sailed a very consistent day with an eighth and a fourth which we were happy with. On multiple occasions we had to fight our way through the fleet but we were happy with the way we sailed. The boat felt good and we felt alert and smart," he added. “Overall it was a great day as we jumped into the top 10 and the medal race." Fellow gold fleet sailors Pip Pietromonaco and James Wierzbowski finished the day in 22nd position following a 23rd and a sixth. The silver fleet finally got some racing in, with Josh McKnight and Nina Curtis the leading Australians after the first three finals races in fifth position. McKnight and Curtis began the day with a 31st, before finishing ninth in race two and 11th in race two. Euan McNicol and Lucinda Whitty are currently eighth in the silver fleet, with the pair finishing the day with a 16th, a black flag and a fourth.